If you are coming to Seattle from out of town to receive care at Seattle Cancer Care Alliance (SCCA), we recommend that you arrange temporary housing as soon as you know your arrival date. Options include two residences for SCCA patients and their families. Both can accommodate people needing extended-stay housing. Note: Patients undergoing a bone marrow or stem cell transplant are asked to live within a 30-minute drive (in heavy traffic) of the SCCA outpatient clinic on South Lake Union or University of Washington Medical Center. SCCA House, located a few blocks from the SCCA outpatient clinic with free shuttle service, provides a healing environment for a few nights, weeks, or even months. The 80 suites include kitchenettes. See details about amenities, rooms, and prices. Pete Gross House, designed specifically for patients recovering from a stem cell or bone marrow transplant, is a 70-unit apartment building located less than one-half mile from the SCCA outpatient clinic, with free shuttle service. See details about amenities, rooms, and prices. FAQs about the differences between SCCA House and Pete Gross House, who can stay, paying for housing, and our wait lists. The Collegiana, with spacious, quiet rooms near University of Washington Medical Center (UWMC), offers a free shuttle to UWMC, Internet access, laundry, and full kitchen in the common area. Ronald McDonald House, for patients being treated at Seattle Children’s or SCCA and who live at least 45 miles away, has hotel-style living space and self-sufficient apartments for pediatric patients and their family members. RV parks nearby, for patients living in a recreational vehicle during treatment at SCCA. Contact our housing coordinator at (206) 606-7263 or e-mail housing@seattlecca.org if you have any questions about housing. Pete Gross House provides temporary lodging for patients and their families in fully furnished apartments. 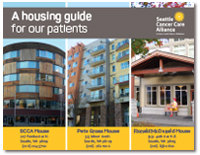 View our housing guide for patients which includes information on housing options, transportation and paying for expenses. View the guide in Spanish.